Snooper MY-SPEED GPS driver safety device provides road speed limits on all UK and Western Europe roads - so you always know what speed your should be driving at! In addition the unit also knows your actual speed and displays this on the 1.77-inch TFT LCD colour screen. Plus if that wasn't enough if you're driving too fast for the speed limt the MY-SPEED's screen turns red and shows an unhappy face. If you're within the speed limit the screen turns green and shows a smiley face, thus ensuring that you are always aware of the speed limit. An optional speed camera database is also available. The speed limit database is £10.00 per update/year. Snooper MY-SPEED has been discontinued. The replacement model is the Snooper MY-SPEED XL (pictured below). View the full range of 2019 speed camera detectors. Snooper MY-SPEED provides your vehicles speed via an on screen GPS speedometer as you drive. In addition this clever unit also includes an updatable NAVTEQ database of road speed limits for every road across the UK and Western Europe! So no matter what road you're travelling on you will be aware of your speed and the road speed limit. Road speed limits are given both audibly and via the 1.77-inch TFT LCD colour display so you always know what speed you are driving and what speed you should be! Also available to buy the Snooper MY-SPEED AURA, this alternate product provides speed camera locations via the Aura speed camera database in ADDITION to road speed limits. Currently we are selling the AURA version with FREE lifetime speed camera updates. 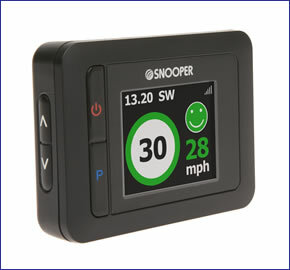 When driving on any road in the UK or Western Europe the Snooper MY-SPEED lets you know the road speed limit. The bright TFT LCD screen displays the road speed limit and also your vehicles own speed in either MPH or KPH. The screen colour also changes red or green depending on if you are above or below the posted speed limit, as an added attention grabbing measure! Want to know where the UK and Western Europe* speed camera locations are? The MY-SPEED has the ability to warn of approaching speed and safety cameras when you buy and download the Snoper AURA speed camera database. Please see AURA database, to read all about it. *Not all Western European countries speed camera locations are included in the AURA database. Please click the link above to find out which countries are covered. Do you have a question about the Snooper MY-SPEED that's not been answered on this webpage? Please see our speed camera detector FAQs for questions from other customers and visitors. Plus if the answer to your question isn't featured, use the online form to ask us for the answer. Alternatively please telephone 01733 777623 Monday to Friday (9:30am-5:00pm) to speak to one of our sales team. Snooper MY-SPEED is a plug and play device. Inside the box you will find a windscreen mounting bracket, this attaches to the inside of your windscreen. A separate cigarette lighter car charger provides power to the MY-SPEED and you're ready to go. The MY-SPEED speed limit database is supplied by NAVTEQ and updated on a annual basis, and is available at £10.00 per update/year. The AURA database is updated daily, so you can update your speed camera locations on the same fequency if you like. Please note: the speed limit database is only updated once a year. It is fully legal to use a speed camera detector in the UK. However, before using the Snooper MY-SPEED outside of the UK we STRONGLY RECOMMEND that you check to ensure that the use of a speed camera detector in other countries is also legal. The My Speed will only operate on Windows computers. Specifically, you must be using Windows XP (32 bit), Windows Vista, Windows 7 or Windows 2000. Additionally the software will only work with Internet Explorer 6 or Netscape Navigator 6 or above. The Snooper My Speed will not operate when using Windows 95, 98, 98SE, Millennium, Windows XP (64 bit) or Apple Macintosh operating systems. ‣Display: TFT LCD 1.77-inch colour (128x160)"